Set within mature, secluded grounds including a walled garden of 0.7 acre and one of the most picturesque properties in the area. 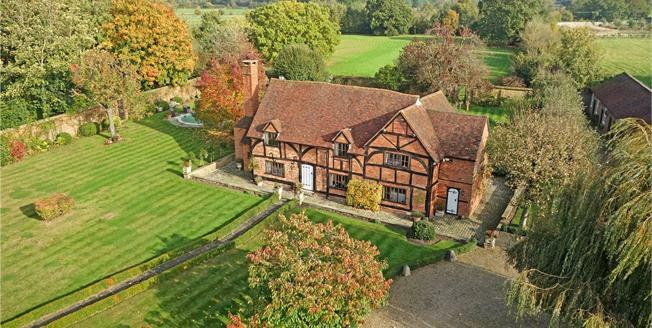 The property is Grade 11 Listed and dates back to the mid-late 15th Century and a former 'Hall house'. Subsequently it was known as The Prince of Wales Public House and then converted to a private residence with a later addition. There are many original and most interesting features, as you would expect from a property of this period, including vaulted ceilings to the bedrooms, a large inglenook fireplace, stone floors to the ground floor and a wealth of exposed wall and ceiling beams, all fastidiously maintained by the current owners of over 30 years. In addition to the house, there is a separate annexe, converted from some of the stables, which provides delightful, ancillary accommodation overlooking the gardens. We throughly recommend this property for the integrity of its period, being a true, period country house, set in private grounds and within Winkfield village. Winkfield is a charming rural village about 7 miles to the South West of Windsor and 4.5 miles North West of Ascot. Windsor offers regular train services to both Paddington and Waterloo and Ascot has services direct to Waterloo. Shopping facilities are well catered for in the general area with a variety of supermarkets and malls. Junctions 6 and 8 of the M4 are about 7 miles away and provide good access to central London, the West Country and Heathrow which is about 14 miles away. There are exceptional schools in the area, including St. Mary’s School, Heathfield, St. George’s, Eton College, Wellington College, Lambrook Prep School, Hall Grove, Papplewick, The ACS International and TASIS. Recreational facilities across the area include horse racing at Ascot, polo at The Guards Club, various health and tennis clubs, leisure centres, cinemas, theatres and even a dry ski slope. With both the River Thames and Windsor Great Park not far way there are miles of beautiful country walks as well. The gardens very much compliment this wonderful period gem, providing formal gardens which include box hedging, stone pathways, a delightful pond surrounded by rose bushes and mature flowering shrubs, a fruit orchard and all interlaced with lawned areas. There is a terraced area adjoining the house with stone retained wall with lavender bushes and a swimming pool to one side ideally sited for the sun. There are numerous outbuildings and stables which includes a covered area for two cars. In addition, there is a wrought iron gate leading through the wall, to a well tended grass field. Potential buyers should be aware there is a public footpath across this. In all, the garden and grounds extend to 2.44 acres.